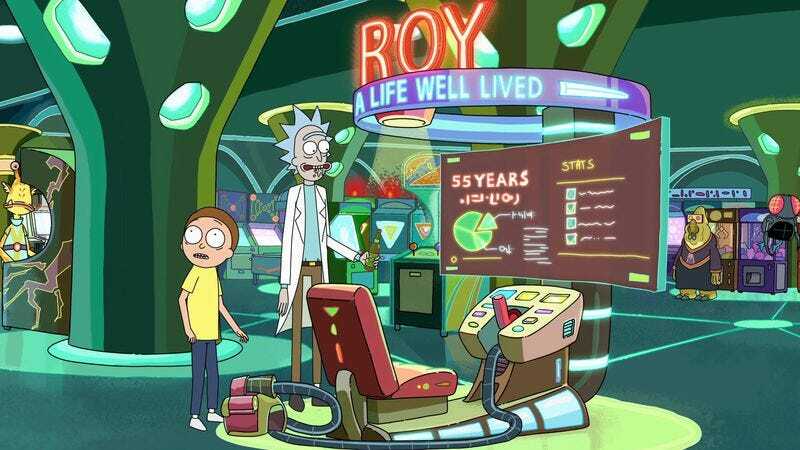 By all accounts, Adult Swim’s Rick And Morty is funnier, more exciting, and more existentially terrifying than real life, and now anyone who has been wishing they could ditch their problems and enjoy a simpler existence alongside an alcoholic scientist and his grandson can finally achieve that dream thanks to Rick And Morty: Virtual Rick-ality, a new VR experience from Adult Swim Games Owlchemy Labs. You’ll still have to eat food and go to the bathroom and stuff, but nobody says you can’t do that while wearing a VR headset and spending time with all of your favorite Rick And Morty characters. Rick And Morty: Virtual Rick-ality will be available for HTC Vive and Oculus Rift headsets on April 20, a day that otherwise has very little significance for Adult Swim viewers and Rick And Morty fans.